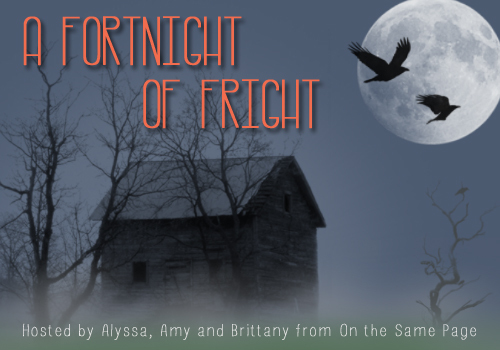 Fortnight of Fright 2014: Guest Post from Author Bethany Griffin! Today, I am SO excited to welcome author Bethany Griffin to the blog! I asked her to participate in A Fortnight of Fright and she graciously accepted, offering up a guest post for all the readers today! I read her most recent book, THE FALL, as one of my Halloween reads this year so I’m especially excited to read more about it in today’s guest post! I’m going to begin by saying that I hope that most (all?) of my settings are developed enough to be characters within the stories, but in The Fall since the setting is a haunted house, it’s a little easier to consider it a character, and even to give it some personality and a will of its own. I tend to layer my stories in that I lay out the bare bones of plot and dialogue first, and then add in details and description, and then delete what isn’t necessary, layer in more, delete, etc. until I’m happy with what’s on the page, so I’d say in the Fall, about 25-30% of what’s on the page was original to the story, and the rest was added as I worked back through the story over multiple drafts. So, in The Fall, the house has intent—it wants the Usher line to continue, though it eventually drives every Usher mad. It wants to control Madeline. At times we believe it enjoys her adoration, at times it seems directly antagonistic towards her, particularly when she doesn’t do as it wants. The house is more parent to Madeline than both of her actual parents combined. The following scene is from Madeline’s 15th year, when she’s starting to investigate everything, furtively looking for ways to subvert the will of the house. My feet make no sound as I slip from my bedroom into the corridor. Cassandra follows. I thought I heard Roderick in the corridor, but he is very obviously in his room. Even from here, I can hear the sounds of his breathing. Roderick’s door isn’t fully closed. Though he ignores the power of the house, he knows instinctively not to be trapped inside any of the rooms. I brush my hand against his door as I pass, pulling away quickly so the house can’t urge me to go in. A black curtain billows in my face. Silk slides against steel as the curtain unravels from the rod, pushing me to the thick carpet that muffled my footsteps moments ago. The cloth molds to my face, pressing into my mouth as I gasp, trying to draw enough air to scream. We see the house through Madeline’s eyes, so the reader should get her sense of the house as an entity, and though they may question Madeline’s perceptions, it’s impossible not to see the house as a sort of looming presence. Another BIG thank you to Bethany Griffin for that great guest post! One of my favorite things about the book was how much the house was really a part of it so it was so great to get a bit more insight on that too! I highly recommend THE FALL for one of your creepy Halloween reads this year too! If you want to check out my review for THE FALL, you can do that here! This entry was posted in A Fortnight of Fright, Blog Event, Books, Guest Post and tagged A Fortnight of Fright, Books, Ghosts, Halloween, Horror, Paranormal, Recommendations on October 27, 2014 by Brittany. Today, Ellen from Quest Reviews has a book recommendation for us — Anna Dressed in Blood by Kendare Blake. Take it away, Ellen! Cas Lowood has inherited an unusual vocation: He kills the dead. So did his father before him, until he was gruesomely murdered by a ghost he sought to kill. Now, armed with his father's mysterious and deadly athame, Cas travels the country with his kitchen-witch mother and their spirit-sniffing cat. Together they follow legends and local lore, trying to keep up with the murderous dead—keeping pesky things like the future and friends at bay. If you’re a fan of YA fiction and of spooky stories, chances are very high that you’ll like Anna Dressed In Blood. And, if you also happen to like the CW’s Supernatural, I can pretty much guarantee you’ll enjoy the book. Cas could appear on an episode of the series without anything seeming amiss. I read the book a little over a year ago and was delighted by its spine-tingling thrills. The plot follows Cas, a teenage ghost-hunter, who travels from town to town with his Wiccan mother, targeting ghosts for elimination purposes. When the book opens, Cas is preparing to move to Thunder Bay, where a tip has informed him that a ghost — Anna Dressed In Blood — violently haunts the house where she lived in the 50’s. I think of her again. Anna. Anna Dressed in Blood. I wonder what tricks she’ll try. I wonder if she’ll be clever. Will she float? Will she laugh or scream? How will she try to kill me? We see right away that this particular ghost hunt will be a different sort of case for Cas. He loathes ghosts, because a spirit killed his father, but from the get-go Cas is intrigued by Anna’s story. As a reader, I was too, to say the least. Anna was on her way to a school dance when someone attacked her, spilling so much blood, that her garments were soaked with the stuff. I know, I know — very gruesome. Since then, Anna’s spirit has lived on, and she has a serious chip on her shoulder. (Understandable.) Finding himself more sympathetic to a ghost’s plight than ever before, Cas seeks to uncover he true story of what happened to Anna, instead of merely trying to exterminate her spirit. The book is part action/adventure, part mystery — a combination that is successful. The mood is, for the most part, sombre and serious, except for when high school dynamics get involved. I found this aspect to be the weakness of the book. The intended comic relief of the cast of teenage characters took away something from the story, making the book more ordinary — garden-variety YA. For this reason, I don’t count Anna Dressed In Blood as a particularly favorite read. However, it’s a fantastic, breezy book for those looking for a spooky book to read for Halloween. Thanks, Ellen! Great review and a perfect suggestion for Halloween! It’s one I still need to read myself! You can also see the full review on Ellen’s blog at Quest Reviews! This entry was posted in A Fortnight of Fright, Blog Event, Books and tagged A Fortnight of Fright, Books, Ghosts, Halloween, Horror, Paranormal, Recommendations on October 26, 2014 by Brittany. Today we have Caroline from The Attic bringing you some Halloween book recommendations, but not just any old recs! Find the best Halloween read for you with her awesome quiz! Don’t delay — check out the graphic below!! Having trouble figuring out what to read for Halloween? No worries! This handy-dandy quiz should help you out! Sadly, I could not fit every book into the quiz. But if you want even more Halloween bookish recommendations, check out this infographic from Epic Reads. Some books were on the quiz, some just missed the cut, and some are brand new! What is your All Hallows Read? A big thanks to Caroline for these fantastic Halloween recommendations! I just love the infographic/quiz (you know I do) and it’s just the thing to help people choose their next spooky read! This entry was posted in A Fortnight of Fright, Blog Event, Books and tagged A Fortnight of Fright, Books, Ghosts, Halloween, Horror, Paranormal, Recommendations, Witches & Wizards on October 24, 2014 by Brittany. My Last Kiss Blog Tour: Chatting with Author Bethany Neal! MY LAST KISS by BETHANY NEAL! I am positively THRILLED to be on the blog tour for Bethany Neal’s debut novel, MY LAST KISS! A big thanks to Bethany Neal, The Fantastic Flying Book Club, and Macmillan Teen for arranging and hosting the blog tour! If you’re not familiar with MY LAST KISS, it is being released on JUNE 10th, people! Very exciting stuff! It’s a great mix between contemporary, mystery, and paranormal and it definitely had a Before I Fall type of feel for those of you who were fans of Lauren Oliver’s book! “What if your last kiss was with the wrong boy? “OPEN INTERVIEW” WITH AUTHOR BETHANY NEAL! For my part of the blog tour, I got to interview author Bethany Neal in what we call an “open interview”. So what does that mean? Just that instead of formal Q&A, we actually set up a time to chat about all kinds of things (but of course the book too!) Check out our Q&A below! Brittany: My Last Kiss was your debut novel. What was the biggest inspiration for you to finally pick up the pen (so to speak) and write Cassidy’s story? Bethany Neal: Well, MLK is technically my second novel. I landed my agent with a different YA mystery/thriller love story that didn’t end up selling. But the inspiration for Cassidy’s story came from a number of things. My initial idea was that she was alive and Ethan (then named Evan) had died in a car accident and it was her fault. Brittany: Aww man!! I am always interested in YA mystery/thrillers!! Shame it didn’t sell… I’d definitely hope to read that someday! Beth: Thanks. I hope you do too! I still love those characters so much–especially the dreamy love interest. Beth: Anyway, Cassidy’s so was ironically way too woe is me with her alive. So with some inspiration from the Metric song ‘Help, I’m Alive’ I decided she wasn’t…alive. And the story took off from there. Brittany: Oooooh I love that song. I can totally see that! Beth: No way! That song is MAGICAL! Brittany: I definitely felt like My Last Kiss was a combination of several different types of “ghost stories” all rolled into one. Do you have a preference between contemporary and mystery and horror or a little bit of everything all rolled into one? Beth: I’m a huge fan of shades of gray (but not the 50 kind!). Stories that blend elements of the supernatural while still keeping the characters and plot grounded in some kind of reality are my favorites. Although I do prefer anything with a dark side. Beth: Ghosts have always fascinated me. Their mere existence is just so bittersweet. They’re here, but not here. Being able to see but not touch–it’s heartbreaking. Beth: GAH I LOVE SWAYZE!!!!! Beth: I mean, come on. He’s basically the perfect man. He can dance. He can rip out a bad dude’s throat (in Road House). And he’s BUFF! Brittany: Haha he really can do it all!!! Brittany: Aside from the “unfinished business” of solving her own death, do you think Cassidy came back to tie up other loose ends of her life before it was her time to move on? Beth: I think Cassidy’s staying in the living plain depended on her resolving the horrible way in which she died, but the reason she was brought back was Ethan. Love conquers all…even death and all that. Beth: Oh, don’t get me start on Wesley. Only man alive that could make me approve of a male ponytail. Beth: I know, right! Maybe it’s the way it compliments the pirate mask. Brittany: [Comments about staying on track… The Princess Bride easily distracts people] So Cassidy has to relive her memories in order to put together the pieces of the mystery of her last days/hours. Do you have any specific memories you would relive if given the chance? Brittany: Ohhh, those were the days indeed. We had quite a few bonfires as well! Beth: I’d also tell my younger self to stop being so darn shy! Brittany: Perfect transition into… Cassidy died before she was able to set the wrongs in her life right. If you were given the opportunity, would you ever go back in time to change anything in your life or a you a believer in “everything happens for a reason”/“you learn from your mistakes”? Beth: I do believe everything happens for a reason, but I would totally go back and try to change certain things. For instance, I would apply to film school after I graduated high school. Mostly, I’d be more brave the second time around. Beth: I like the ends of my life, just not necessarily the means. If that makes sense. Brittany: It definitely does! I feel like I would have changed a few things here and there BUT I always wonder (oh, parallel universes) if that would change where I ended up and I would never want to change the end result! Beth: I’ve seen enough time travel movies to know it doesn’t end well, but I don’t think I could resist the urge. Beth: And if you hold on to the everything happens for a reason fate thing, you will end up where you are now anyway, it’ll just be by a different path. No alternate universes allowed! Brittany: Never a problem! I always enjoy a good philosophical discussion that includes parallel universes too haha! Beth: Oh, how creepy for you! Should I say sorry or you’re welcome?? Brittany: Haha it’s a good kind of creepy, no worries! I actually really enjoy making that connection!! Beth: The birthday party scene was one of the first I wrote. I usually don’t outline before I start writing, so it came to me very organically. The party atmosphere and interactions are very much familiar from snapshots of my teen years. Though my main goal was to have a ton going on with very few answers offered to the reader so they’d be placed in the chaotic state of mind Cassidy’s that night. I didn’t make a conscious effort to address Cassidy’s youth by having her die at her 17th birthday party. Beth: I think subconsciously I may have though. Brittany: Ooh very awesome! A lot of that reminded me of my teenage/younger years as well! Organic is the perfect description. It all just felt so natural and real. Beth: My subconscious works overtime when I write. Brittany: haha it’s funny how that works! Beth: Good! It was important to me that even though Cassidy was a ghost the story felt real. Beth: I did have a real life location in mind while I was writing about the bridge/river. My hometown is in a river valley and there’s a rail bridge near my boyfriend’s parents’ house that I mentally spruced up to make it more visually interesting. I even have pictures for you on this one! Here’s the rail bridge that I changed into a covered bridge in the book. Brittany: I definitely felt like I had a good picture of the bridge so I loved how easy it was to picture! 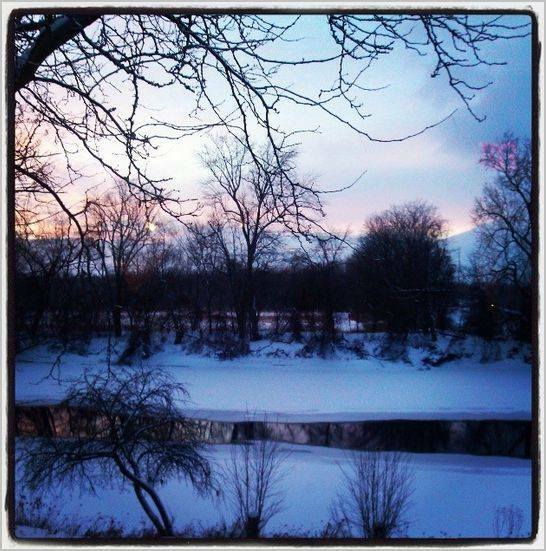 Beth: And here’s a picture of the river taken last year on the exact day Cassidy died. Creepy-awesome or what? Brittany: Ooooooh creepy-awesome for sure! Brittany: Thank you SO much for letting me interview you! I had a blast with the open interview format and so happy we got to chat!!! Beth: Mind if I ask you a question? Beth: Which character did you just adore and which character did you want to punch off the page? Beth: This is so interesting and fun to hear! Beth: It so is. This is officially my favorite part of being an author. Another HUGE HUGE HUGE thank you to Bethany Neal! We had such a blast chatting and I really loved the open interview format. I had such a great time talking with Bethany Neal about My Last Kiss (and of course, Patrick Swayze and bonfire memories and The Princess Bride). Want to connect with Bethany Neal? (I’m sure you do after that amazing Q&A!) Check out her links below! And be sure to check out the stops on the MY LAST KISS blog tour too! They have some other amazing features for this fantastic book! There’s also a fabulous giveaway and prizes for one lucky winner! Please see all of the details below before entering. Good luck!!! – A false entry will be consider as cheating, so this person will be disqualified. This entry was posted in Blog Event, Blog Tour, Books, Contemporary, Mystery/Thriller, Paranormal, YA and tagged Bethany Neal, Blog Tour, Books, Contemporary, Ghosts, Interview, My Last Kiss, Mystery/Thriller, Paranormal, YA, Young Adult on June 5, 2014 by Brittany. I was actually really surprised with the content of A DAWN MOST WICKED. I feel like a lot of times these novellas/extras that accompany the full length novels don’t usually include so much plot and explanation, but A DAWN MOST WICKED takes us back to three years before SOMETHING STRANGE AND DEADLY begins with Daniel Sheridan and the story of his first love as well as how the gang of Spirit-Hunters came into being. I’m so, so glad that this novella was from Daniel’s POV and that we got to know so much more about him because if there was one thing I was missing in SSaD, it was that connection to Daniel and that “oomph” in the romance between him & Eleanor. I felt his passion in A DAWN MOST WICKED and this novella also helped me understand his hesitance and his hard shell towards Eleanor. What I was most surprised about was the story development involved in A DAWN MOST WICKED. So many novellas are just little bonuses, but there was an actual plot twist here by which I was surprised and then impressed because after it happened, I said, “Ohhhh that makes sense!” It was incredibly creative and intriguing and a major point that wasn’t revealed in SSaD. It’s also the biggest piece to the puzzle as to how Joseph, Jie, and Daniel all ended up working together. Daniel: Hurrah! I made a connection with Daniel!!! I mean, I had in SSaD but not quite as much as I wanted to. I loved his spirit in this book and it was nice to see his first love in action here. Cassidy: Cassidy is the captain’s daughter and the object of Daniel’s affection. Cassidy seems very much like Eleanor (which explains why he falls for Eleanor in the first place) and I kind of loved her! I love that she wasn’t some prissy girl and was totally badass on the Mississippi. This novella was so much fun. I loved getting to know more about Daniel and I think it’s an excellent read for anyone who’s a fan of the series! This entry was posted in Books, Paranormal, Review, YA and tagged A Dawn Most Wicked, Books, Ghosts, Paranormal, Review, Something Strange and Deadly, Susan Dennard, YA, Young Adult, Zombies on June 20, 2013 by Brittany.